The largest securitization in Balboa Capital’s history was rated by both DBRS and Moody’s Investors Service, Inc. The additional lending capacity will be used to support businesses that need growth capital. Our solid financial performance and trusted business model have enabled us to complete a securitization that greatly increases our lending capacity. 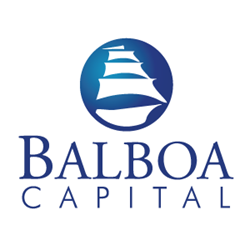 Balboa Capital, a leading direct lender that offers equipment leasing and small business loan products, today announced it has successfully completed a $266 million securitization of equipment lease and loan backed notes, its fifth and largest transaction to date. Credit Suisse Securities (USA) LLC and SunTrust Robinson Humphrey acted as the joint purchasers of the notes, and the transaction was rated by both DBRS and Moody’s Investors Service, Inc. Balboa Capital will use this additional capacity to provide growth capital to small businesses, middle market companies, franchises, and equipment vendor businesses throughout the United States. “Our solid financial performance and trusted business model have enabled us to complete a securitization that greatly increases our lending capacity,” said Heather Parker, Controller at Balboa Capital. “This additional capital gives us the operational and financial flexibility needed to pursue our strategic growth initiatives, and continue delivering on the expectations of our customers.” This securitization follows a strong 2017 for Balboa Capital. “Last year’s uptick in business owner confidence and optimism seems to be carrying over into 2018. We are continuing to see a high demand for capital equipment financing, renovation and improvement loans, and other business investment initiatives," said Ms. Parker. To support its business growth strategy, and to increase its ability to serve current and future customers, Balboa Capital is expanding its staff in a number of departments. “Our technology-driven lending platform and dedication to our customers are vital to our success, and we are taking the steps necessary to support our anticipated growth. We created an all-new careers page for our website, and have already hired close to 50 employees this year,” said Ms. Parker. Balboa Capital is a technology-driven financing company that provides business owners with fast, hassle-free solutions to fuel their growth and success. The company specializes in small business loans, equipment financing, commercial financing, equipment vendor financing, and franchise financing. Balboa Capital developed an intuitive online platform that simplifies the entire financing process. Calculators provide instant estimates, applications can be completed and submitted in a matter of minutes, and sophisticated credit scoring technology provides instant decisions. To learn more, visit http://www.balboacapital.com.